Best Casio Digital Piano Privia for the Money! I LOVE the Casio Digital Piano Privia! Are you looking for a cool and affordable Casio Privia digital piano for your home? The new Casio Privia is a superb digital piano that has been improved to sound and feel as close to a real acoustic piano as possible! Because of that it is the perfect digital piano for a beginner piano student who cannot afford or doesn’t want to buy a real piano. The touch is very similar to a real piano and this is really important for a beginner, since later on they will probably want to try playing on a real piano. This one you see on this picture is the new Casio PX850 and it has been greatly improved to sound like a grand piano. The keys have also been improved from the previous models. What most buyers love about the Casio digital piano Privia is that they are getting a great digital piano for a great price! I think you will not be disappointed in your new Casio Privia! *Here you will find the top selling models based on popular they are among their buyers and my own personal opinion as a piano and keyboard teacher. Casio Privia PX-850 88-Key Digital Piano Bundle! 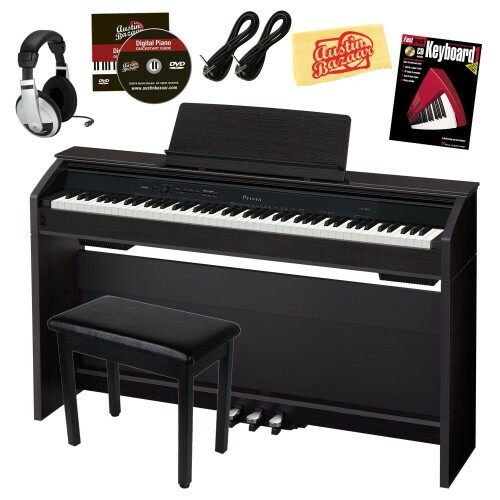 This is still the same piano from the picture above, the Casio Privia PX-850, except you are now getting everything you see on this picture, including the awesome piano book and headphones! As you can see it also opens on top, just like a grand piano, to make the sound even better! *Great Casio Privia PX-850 video review! Cheap Casio Digital Piano Privia! This gorgeous champagne gold color Casio Privia PX-160 is one of the cheapest Casio digital piano Privia models out there! 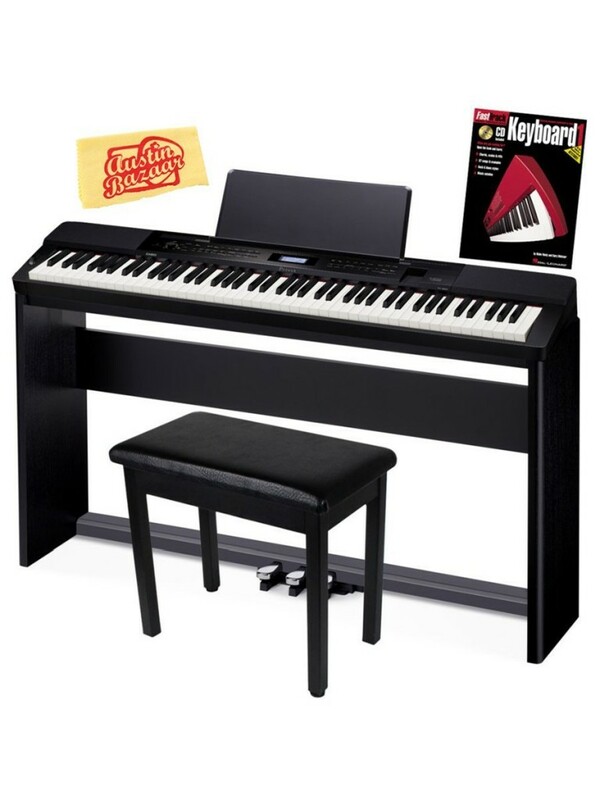 It is very compact, it comes with the bench, pedals, furniture stand and piano book and it is perfect for anyone starting piano lessons! The keys also feel great and it also sounds incredible! I would recommend this model to a beginner or intermediate piano player. Best Casio Privia Pianos for the Money! This is the black Casio Privia PX-350 model. The one above is the Casio PX-150. This one is slightly more expensive, but still a great deal for your money! The sound is even more improved than the previous model, to make it sound close to a Clavinova, which is way more expensive. 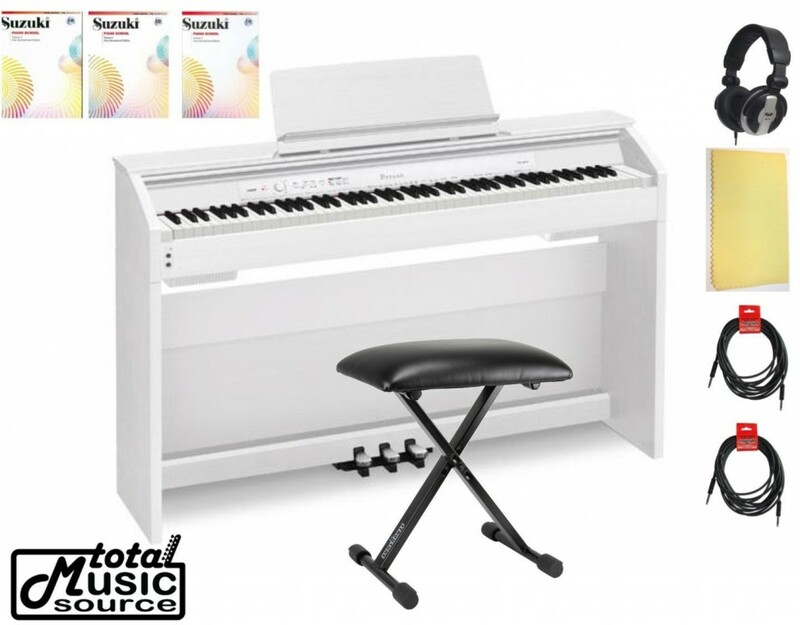 This bundle also comes with the bench and piano lesson book and it will look great anywhere! Excellent digital piano for small rooms or bedrooms! Best Casio Privia Digital Piano for Professional Musicians! If you are a professional musician that plays the piano at night for a living or you have wedding gigs, birthdays, etc this is the best Casio Privia piano for you! It is incredibly lightweight and it has the most incredible hammer action on the keys and a beautiful rich piano sound! It has a multitude of tones and layers for professional playing on stage! You can also insert all kinds of effects and play several kinds of sounds! Of course you can also record everything and edit everything on your computer as well. 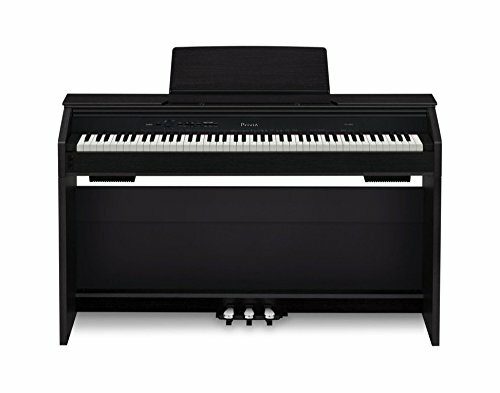 this Casio Privia stage piano is almost like having your very own music studio all in one 25 lbs piano! *Here is an awesome demonstration! 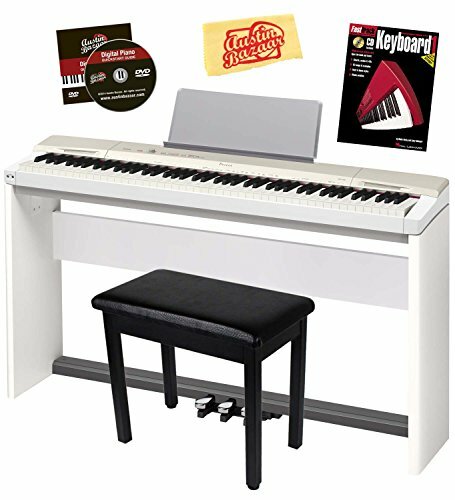 Beautiful White Casio Privia PX-850 Digital Piano Home Bundle with all Suzuki Piano Books! 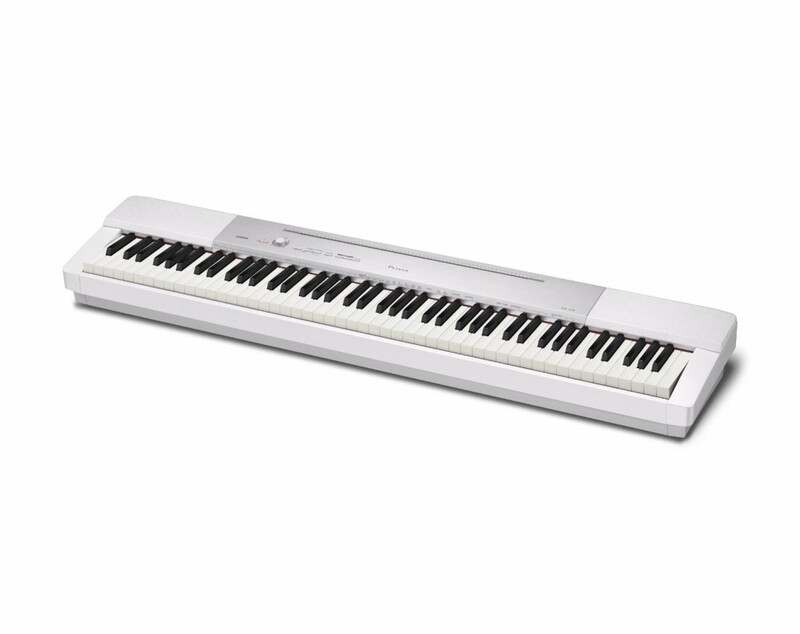 This is a gorgeous and very affordable white Casio digital piano Privia PX-850 bundle that includes the becnh, headphones and three Suzuki piano books in the mix! What a great deal for your money! This model also has a great speaker system for an incredible sound! Perfect digital piano for serious piano beginners, intermediate players and piano teachers! Cheapest Casio Privia PX150 88-Key Digital Stage Piano for Sale! 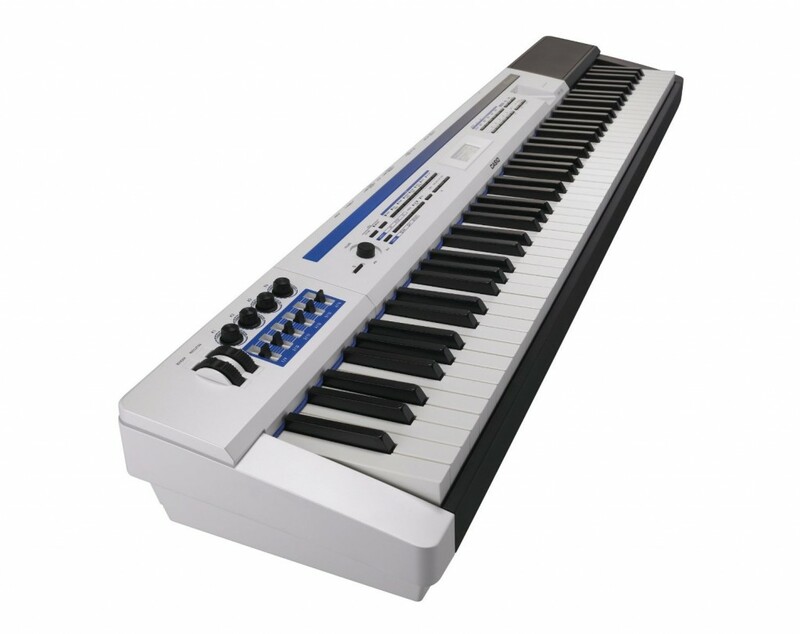 This is one of the cheapest Casio Privia PX-150 full-size stage piano keyboard for sale! You can get it in this beautiful white color or black! Perfect piano keyboard for a teenager to have in his bedroom! Perfect to take to your friends houses too! It has an amazing sound and the keys are all weighted. It also has an USB connection and several voices and tones!